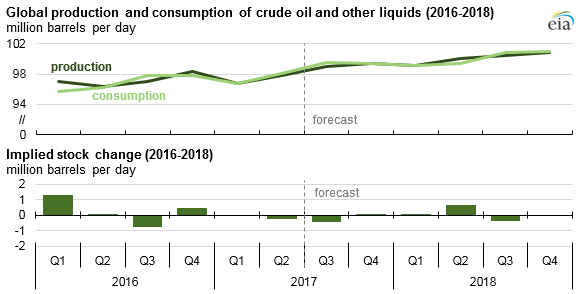 Forecast world production of crude oil and other liquids in 2017 and 2018 was revised slightly downward in the June edition of EIA’s Short-Term Energy Outlook (STEO), which was issued after the May 25 announcement by the Organization of the Petroleum Exporting Countries (OPEC) of an extension to production cuts that were originally set to end this month. OPEC’s crude oil production target will remain at 32.5 million barrels per day (b/d) through the end of the first quarter of 2018. Given the extended production cuts, EIA now forecasts OPEC members’ crude oil production to average 32.3 million b/d in 2017 and 32.8 million b/d in 2018, down 0.2 million b/d and 0.4 million b/d, respectively, from the previous STEO. Total OPEC liquid fuels production is also expected to be lower than previously forecast. However, continuing production growth in many non-OPEC countries is expected to moderate the pace of global liquid fuels inventory draws in 2017. EIA expects a small inventory build in 2018. Inventory draws expected in the second and third quarters of 2017 suggest the possibility of some increases in crude oil prices over the coming months. However, because U.S. tight oil production is relatively responsive to changes in oil prices compared with offshore production, and even given an estimated six-month lag between a change in oil prices and realized production, higher crude oil prices in mid-2017 have the potential to raise U.S. supply in 2018. The largest global inventory increase in the forecast occurs in the second quarter of 2018, when Brazilian and OPEC production are expected to increase by 570,000 b/d and 220,000 b/d, respectively. Supply growth in 2018 could contribute to downward pressure in oil prices as early as late 2017. EIA’s STEO forecast assumes OPEC cuts will be extended beyond March 2018 but that non-compliance will begin to grow late in 2017 and increase in the second half of 2018. Although this forecast reflects the assumption of increased non-compliance with a second production-cut extension in 2018, any extension provides some support for crude oil prices, even if only temporarily, which would partially offset downward price pressure from growing inventories. The June STEO forecasts a 2017 average spot price for Brent crude oil of $53/barrel (b), with prices increasing to $56/b in 2018. Average West Texas Intermediate (WTI) prices are forecast to be $2/b lower than Brent prices in both 2017 and 2018. As always, all oil price forecasts are subject to considerable uncertainty. For example, EIA’s forecast for the average WTI price in September 2017 is $51/b, but analysis of options trading suggests market expectations range from $39/b to $64/b at the 95% confidence interval. Note: Confidence interval derived from options market information for the five trading days ending June 1, 2017. Intervals not calculated for months with sparse trading in near-the-money options contracts. EIA expects U.S. crude oil production to increase through 2018, averaging 9.3 million b/d in 2017 and 10.0 million b/d in 2018. The 2018 STEO forecast exceeds the previous record U.S. production level of 9.6 million b/d set in 1970. Growth in U.S. production of crude oil and hydrocarbon gas liquids has been the largest contributor to the 820,000 b/d of non-OPEC liquids supply growth from January through May 2017. Continued increases in drilling activity in U.S. shale basins, particularly in Texas, support production increases throughout the forecast.